Have you been injured while playing golf? Looking to learn more about the most common golf injuries? On these pages, you will find all of the information that your are looking for regarding the most common golf injuries, how to manage these injuries through exercise, and how to prevent these injuries from happening in the first place. Two key ways to help prevent injuries are to create a golf strength training program in addition to performing flexibility exercises. Click here to ask injury related questions or share your golf injury/rehab story with others! The most common golf injuries occur in amateurs are at the back, shoulders, and elbows. In professionals, it the the lead wrist, back, and lead shoulder. 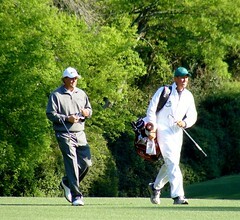 I'm sure you have heard the debate on whether or not golfers are athletes. While the amount of physical demand in golf may not be the same as in football or soccer, it certainly takes a lot of skill, concentration, strength, and flexibility in order to properly swing a golf club. Now take into account swinging that club hundreds of times, and actually being good at it. Golf truly is an athletic event and it takes practice and training so that you can properly and efficiently use your body to maximum benefit. Believe it or not, but golf is one of the higher injury producing sports in the United States. This could be attributed to a large number of factors, including the shear number of participants, repetitive nature of the swing, and wide range of participant ages to name a few. One very shocking statistic that was found through research is that 50% of amateur golfers will suffer a low back injury related to golf at some point in their lives. Injuries are the by-product of a handful of factors. Some of these factors are strength, flexibility, posture, form, and even genetics. While we can't change the genetic factor, we certainly can change muscle strength, tissue elasticity, posture and technique. One thing that probably doesn't get enough attention is posture. From my experience as a clinician, I have seen how many people neglect their posture. The concepts of sitting up straight, or standing more upright should not be foreign to anyone but its the application of those concepts that becomes a problem. Bad posture makes your body compensate for the faulty positioning by using other muscles for support. Whenever your body needs to compensate, it is not working efficiently. With your golf swing, we want everything to be working as efficiently as possible! A great example of how improper posture can affect your swing is how a poor setup and stance will lead to less trunk rotation. If your golf stance is too slumped or rounded, it causes an abnormal axis of rotation. Keeping your back straight at address will facilitate a smoother axis of motion and will allow your to build up more energy during your backswing. A poor axis of rotation has long term implications regarding golf injuries, as well. In addition to improving your posture and form, a solid golf strength training program should be one of your main components. Strengthening key muscles but at the same time improving range of motion and flexibility will go a long way in helping prevent any injury. If you need more reasons why strength training is important, please go to my Strength Training For Golf page. 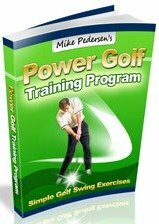 This page will further expand on the basics of a golf weight training routine, and how they will benefit you. If you are not ready for a full golf fitness program but still want something to help prevent injuries, I have begun to create a "Prevention Series" with the first page targeting low back pain. Follow the link to learn more. Finally, making sure that you are performing a proper golf swing will help reduce wear and tear on your soft tissue and joints. Even very minor corrections can have huge implications on your game, not only from a scoring perspective but also in the amount of stress that you place through your body on a repetitive basis. We already mentioned the affect that your back will play on your swing, but other areas will break down if excessive, or improper, forces are placed through them. This is especially true at your elbows. For more information regarding golf injuries at specific areas of the body, please follow the links below. *Knowing your Blood Pressure During Exercise is critical according to your age. Look at the age groups listed here. As you need to stay within your age range for burning excess fat and improving your cardiovascular fitness without stressing your heart. Ever Suffer A Golf Injury? Share Your Story! Been injured while playing golf? Have a rehab tip? Share your story about golf injuries here! Also, post any injury related questions here and if I can't answer it, hopefully, another visitor can!